Franziska is a 26 years old German girl. She came to Puerto to take a little break and learn Spanish. 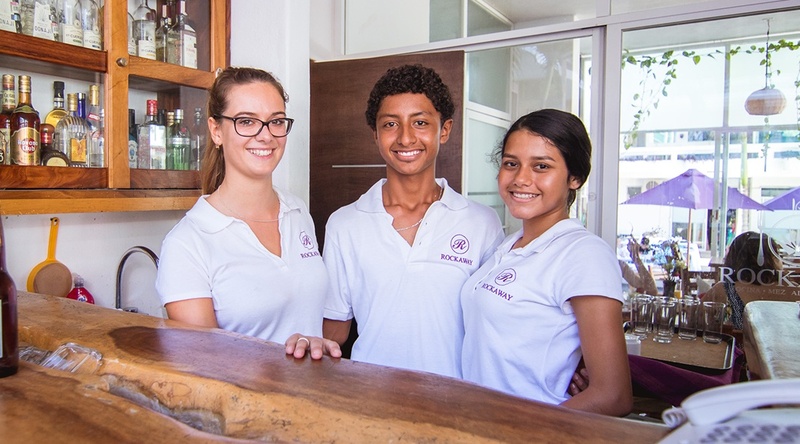 She had the idea of volunteering in a Hotel after taking Spanish classes with us, to practice her skills and to apply everything she learned in our school. She wanted to share this experience with all of us. “On my first day I felt immediately included in the team. Also the communication wasn´t a problem at all. Every time I struggled with Spanish, I could continue in English and guests would always be friendly and understanding for not speaking perfectly Spanish. I choosed to stay in the restaurant instead of the reception. Working in the service was fun and easy. Sometimes I was helping out in the kitchen and learning how to cook delicious, typical Mexican salsas, frijoles, “huevos al gusto”; and more. By midday we used to eat with the Hotels staff. They always had time for “bromas (jokes)”. In those three weeks I have been working in the Restaurant Rockaway, I did not only improve my Spanish, but also learned a lot from amazing people. I experienced the way Mexicans work with more ease, flow, fun and way less constrained then the Europeans. Volunteering in a Hotel was a great idea.